After Part 1 of our Jonah Bible Study for 12 preschoolers, we did a fabu craft I found at Little Window Shoppe. They are called I Spy Bottles. The idea is that you fill an empty water bottle with small items (catalog them as you go), then fill the bottle with sand or rice. Later you shake, spin and roll the bottle to find all the items you put inside. 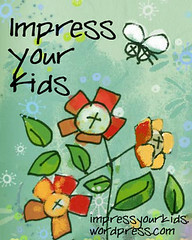 Fun to make, then fun to keep and play with later! Then I headed out to the Dollar Store to find our I Spy items. First on the list? Jonah. I found army men, police men, firemen and cowboys and Indians. I ended up picking the police because they were blue. That seemed ocean-y. But I didn’t notice they all had guns in their hands. Oh, well. I also found a bucket of craft foam fish stickers, a bucket of craft foam beads and a little bag of marble-y things you’d put in a vase. We divided these up into bowls and buffet-style, the kids filled their bottles. Of course, they only got one Jonah (aka Mr. Police Man). We called the beads seashells and the marbles rocks, so the kids thought it was very ocean like. 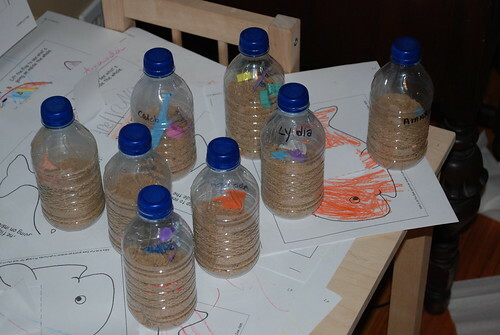 After everyone’s bottles were filled we went back to the Mine/Belly of the Whale and filled them 3/4 of the way up with sand. On their way out we gave them the top lined with white glue and then they sat down to play I Spy Jonah. It was really fun—but took much LESS time than I anticipated. So, we turned on some music and they had to play with their bottles for one full song before we took them back up and wrote their names on their bottles. 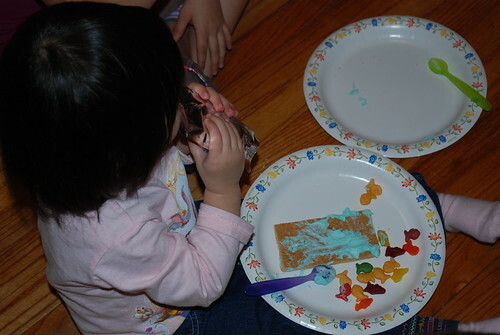 We gave everyone a paper plate with one graham cracker, a few fish snacks, a few goldfish crackers and ONE spoon filled with frosting. 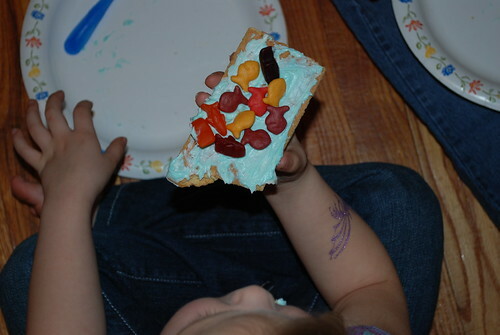 They spread the frsoting on their cracker and decorated it with the fish snaks and crackers. This eliminated mess and the double dipping that is likely to occur when a tub of frosting is set in front of a four year old. We also had a sample one made so they knew what to do when they got their plates. After a few minutes of quiet snack-making and eating, we turned on Veggie Tales’ Jonah and before you can say Ninevah, the parents arrived! Everyone (including myself) was excited about their snacks, their crafts and HOPEFULLY their lesson about God’s plan for their lives! Our theme was: God has a plan for you! We focused on the story of Jonah and how he disobeyed God’s plan. Then we all sat down for the Bible story. I tried to remember some of those “open shut them open shut them” songs to get the kids settled. But I couldn’t. So, we just settled for wiggly kiddos. I read the story like a “sound story”…when certain words came up, they had to make a sound or repeat the word with a motion. For example, every time I said “Ninevah” they had to hold up their finger and say Ninevah in a creepy voice. Then we all acted out Jonah jumping off the boat and being swallowed by a whale. Sound difficult? Well, it was actually quite easy and fun! I had Lydia’s Little Mermaid tent set up by the door to our porch. I crawled into the tent and into the porch. The kids crawled behind me. Inside the porch was my leftover Seven Dwarfs Mine from Lydia’s Snow White Party. But the kids thought we were in the belly of a whale…an open can of tuna adding to the smelly ambiance. We finished the story in there and then spit ourselves back into the living room for a craft!